16GB Secure Digital Class 6 memory card designed to be fast and durable for extensive shooting in extreme environments. Promising minimal transfer rates up to 22MB/s and guaranteed optimal performance for the transfer of images, music and other complex digital data, Delkin Pro SDHC (Secure Digital High Capacity) cards are optimized for use in professional grade digital cameras, DSLRs and camcorders. All Delkin products are manufactured with non-volatile Flash memory, preferred over the conventional form because of its advanced ability retain data over time. Equipped with a write-protection scheme that prevents the accidental overwriting/loss of data, this Flash form is preferred in both complex consumer electronics (PCs, notebooks, PDAs & mobile phones), as well as industrial military & medical applications. Our SecureDigital cards are solid state manufactured with no movable parts to provide ultimate protection for your data files. 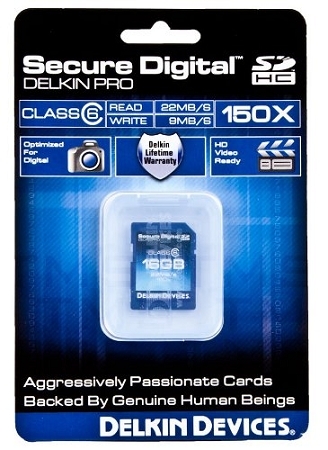 Delkin Pro 150X card must be inserted into an SDHC host device to fully utilize its high-speed capabilities. Delkin Pro memory has been specially ruggedized and optimized for digital photography, video & gaming purposes and tested to perform under extreme environmental conditions between -13F and 158F. With read and write speeds up to 22 MB/s, this advanced memory card is ideal for professionals that are not willing to compromise their digital data.